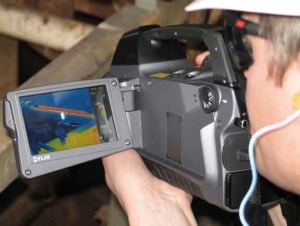 Three years ago FLIR changed gas and VOC leak detection by applying infrared technology to the application. It has since developed a series of dedicated cameras that allow the user to inspect large areas of plant in real time and pinpoint the source of the leak; models can detect a range of hazardous and greenhouse gases including SF6. 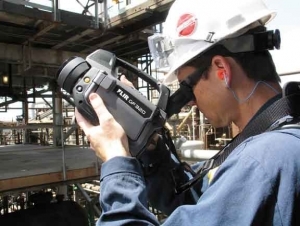 As a result these cameras are now used extensively in the petrochemical, chemical and power generation sectors to protect personnel, reduce waste, contain costs and ensure environmental compliance. With its latest introduction FLIR has added considerable value to this capability. Its new FLIR GF320 infrared camera is for general gas detection, but is fully radiometric as well. This means it can see, measure and visualise temperature too. So in addition to gas leak detection this newcomer can also be used for infrared electrical and mechanical inspection. It is a shining example of FLIR’s drive to provide customers with the very best return on their investment. Many thousands of potential leak sources can be scanned per shift with the FLIR GF320 without having to interrupt the process. It reduces repair downtime, provides verification of the process and above all is exceptionally safe as it allows potentially dangerous leaks of gases, such as carbon monoxide, to be monitored from several metres away. Although gas leak detection is a vital process on any processing site it is estimated that 84 per cent of leaks are found in less than 1% of the plant. However as even one single leak could represent a substantial of loss revenue the discovery of its source by the most effective means is vital. gas detection provides that assurance. As the FLIR GF320 gives a complete picture, areas that do not require further investigation can be eliminated immediately. Furthermore as it has a high sensitivity of <25mK even very small gas leaks can be seen at a good range. It also has inbuilt GPS allowing the service team to be directed to the source of the problem quickly and efficiently. Savings in inspection time and the best use of personnel are clear benefits. Whilst these gas detection benefits are inherent to the entire FLIR GF-Series, the FLIR GF320 with Sterling cooled detector is distinguished by its dual purpose capability.That means it can also be used to look at anything from a worn bearing or faulty electrical connection to a leaking pipe or missing insulation. It is able to measure temperatures from -40°C to +350°C with ±1°C of accuracy. In built video recording, digital camera and laser pointer all enhance the potential of this multi-purpose model. Lightweight – just 2.4kg – and robust, the FLIR GF320 has a high performance and tiltable viewfinder that delivers clear and vivid images even in poor lighting or bright sunlight. The choice of automatic or manual focus with 1 – 8 x continuous zoom allows the users to achieve the optimal view with ease. Image storage in JPEG formats is onto removable SD or SDHC memory card.